Philip Beards creates pool dining tables to customers' exact specifications. 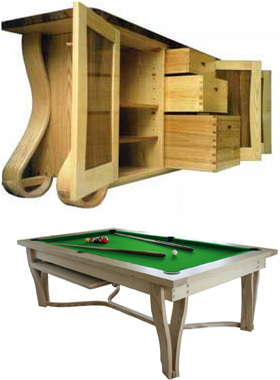 Timbers from around the world are employed to give genuine bespoke pool dining tables. Hand made pool dining tables provide an attention to detail and quality that is simply not possible with mass produced types. Please view some of our contemporary pool dining tables and feel free to contact us with your ideas. Please also view our dedicated snooker and pool dining tables site. Fine Bespoke Furniture not only provides years of service, but also becomes a valuable investment increasing in value over years. Unlike the factory produced reproduction range, which in many cases does not stand the test of time and retains little or no value even though the initial cost may have been considerable. PHILIP J. BEARDS designs, makes and produces individual pieces of furniture, fittings and pool dining tables for your home. For a personalised quote for bespoke, hand made custom furniture, please contact me.